Collectors of diverse surfaces and hydraulic solutions based on a single supporting structure. We constantly design and build new prototypes with innovative solutions. The E-PVT 2,0 hybrid collector is a combination of a solar flat plate collector with a pohotovoltaic module with polycrystalline silicon cells. All elements are made of durable materials and with attention to detail, which ensures long-term and trouble-free operation. As a whole they are enclosed in an EPP casing that minimises heat loss. Over thirty years' experience in the installation and solar industry, large production potential as well as human and technical resources, but also deep concern for the environment and constantly rising energy prices inspired us in 2006 to start production of solar devices. 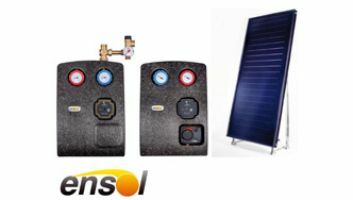 Since the very beginning the activity of ENSOL has been oriented towards manufacturing of flat solar collectors, assembly sets as well as towards completing and selling solar fixtures and complete solar systems. Our design and engineering facilities have enabled us to work out and implement our own solutions in several types of collectors diverse in respect of surface and hydraulic solutions. On the basis of a uniform supporting structure we have created the whole range of collectors characterized by their innovative solutions and high quality as regards their aesthetic qualities and operational efficiency. All our products undergo testing and certification carried out by recognized world renowned research and certifying agencies, namely TUV Rheinland and DIN Certco, and they successfully pass all quality tests. The international quality label „Solar Keymark” on most of our products constitutes an undeniable proof of that. High quality of products, as the main objective of our activity, is not necessarily the cheapest solution at the investment stage. However, in an over twenty- year perspective of a collector’s lifespan it shall bring measurable financial results. We have deliberately and intentionally chosen the most restrictive and reputable research centers, which in every respect confirm our products’ quality in the eyes of our current and potential customers. When you purchase our products you can be sure of making the right decision. Expertise, educated staff and cooperation with universities, among others AGH provide the potential for introducing new, often innovative solutions. Modern production halls equipped with a whole range of different devices and specialistic machines enable us to produce at a larger scale, taking care of reproducibility and quality. The highest quality of our products is confirmed by TÜV Rheinland and DIN CERTCO certificates. Quality is a way of thinking for us, which means that we are constantly looking for the best solutions.